Deep in the jungle, in the village of Ban Nam Hom several students and I went on a late afternoon hike. As an avid backpacker in North West America I can honestly say that I have never experienced such an uncomfortable trek. All and all, the hike was hotter than Patrick Swazi in Road House. The intense humidity made us feel like we were hiking in a sauna. Aside from the hot and humid conditions, I was suffering from abdominal cramps wile hiking because I had acquired some bad bacteria during our travels. Overall, Hiking in Thailand can be an uncomfortable experience, however; it’s an experience that I would highly recommend. During the hike we saw many unique Buddhist shrines, flowers, fungi and insects. We also crossed paths with many rice farmers who wore ninja looking outfits. 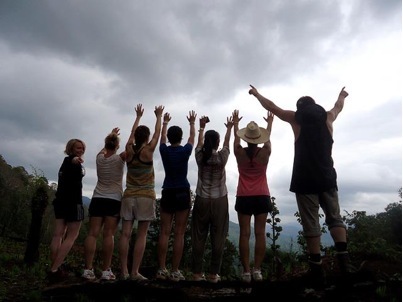 At summit we all caught a glimpse of the entire Ban Nam Hom village. After hiking several miles we made it back to the school of Ban Nam Hom just in time to shower our sweaty bodies and eat the fantastic dinner that was prepared by the local villagers.